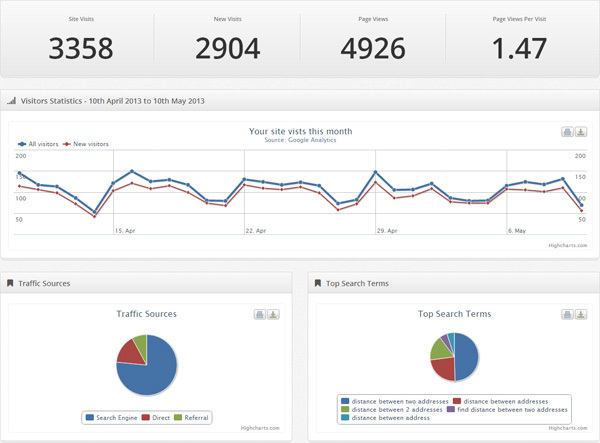 With YourSiteAdmin you get a handy dashboard where you can see some quick stats about your sites, quick links to manage the pages on your site and the latest updates that have been made. 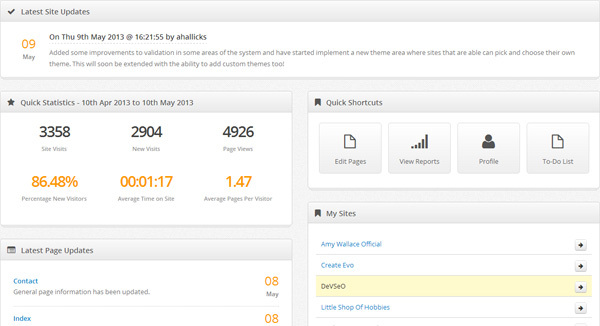 Your dashboard is the central hub for the administration for your site. From here you can begin building the site you need for your business, or pleasure. And much more... plus we're always adding new reports where possible! If you don't have a Google Analytics account, or don't know how to set up Analytics, we can do that for you too so you can see all of your reports at the click of a button. You can add and edit as many pages as you like. Depending on your selected theme (or custom built site, which we also offer) you can have a dropdown menu for any sub-pages you create. There is a very simple-to-use text editor so you can easily add formatting to the text on your pages. You can even drag and drop pages around to position them in the order you choose! If you haven't finished creating a page, or don't want it show yet, we have that covered too. Each page has a status that allows you to keep it unpublished and only publish it when you are ready to do so.